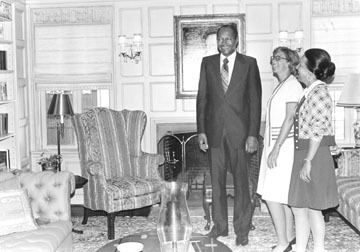 MAYOR TOM BRADLEY with Larchmont Chronicle founders Jane Gilman and Dawne Goodwin at Getty House, 1976. The Board of Trustees of the Los Angeles Community College District honored the life and contributions of the late Mayor Tom Bradley at a 100th birthday celebration at Los Angeles Trade Technical College in December. The Board of Trustees named a facility at the college in honor of Mayor Bradley. The five-term mayor is known for opening City Hall and city commissions to women, minorities and people with disabilities, and for bringing the 1984 Summer Olympics to Los Angeles. Born in Texas, Mayor Bradley moved to Los Angeles when he was seven years old. He grew up in South Los Angeles and attended Polytechnic High School (now Los Angeles Trade Technical College), becoming a track star before moving on to UCLA. After graduating, Mayor Bradley served in the Los Angeles Police Department for 21 years, attaining the rank of lieutenant. He later attended Southwestern Law School, passed the bar, and became an attorney. In 1963, he was elected to represent the 10th district on the Los Angeles City Council, and he served as mayor of Los Angeles from 1973 to 1993.